From the ancient palace gardens of China comes an elegant empress, the tree peony. Native to China, the tree peony (Paeonia suffruticosa) has been grown by Chinese herbalists, gardeners and nobility for more than 1,500 years. In 1994, China named this beauty as its national flower, giving it a treasured place in history and sparking more interest in its botanical nature worldwide. 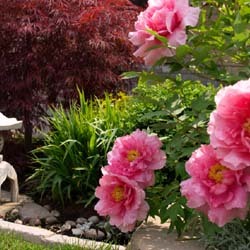 In recent years, tree peonies have become increasingly popular and more readily available for landscape use. This plant is distinctly different from the herbaceous peony that we are so familiar with in our American perennial beds. The tree peony is a deciduous woody plant with fern-like foliage that produces larger flowers two weeks earlier than its perennial partner. These blossoms come in a wide range of shapes, colors and fragrances depending on the cultivar, providing great variety to suit any landscape. Not sure if the tree peony will be best for your landscape? Learning more about these exotic beauties can help you decide if you want to welcome one to your yard. This slow-growing woody shrub grows 4-10 feet tall with distinctive, silken blossoms in a multitude of shapes, colors and fragrances. Flowers best with most vigorous blooms in dappled shade with 3-4 hours of filtered sunlight per day. Tree peonies require a site with good drainage amended with plenty of organic matter. Space plants at least 4 feet apart to provide good air circulation. Prefers a soil pH range of 6.5-7.0. Use organic mulch or added sulfur to lower the pH level if necessary for the best nutrition. Tree Peonies are heavy feeders. Do not fertilize the first year. Foliar feed in the spring of the second year when the leaves emerge with an organic fertilizer. Fertilize again after blooming and again in the fall before dormancy. Spread organic material (compost or manure) around the base of the plant each spring and gently work into the soil for slowly-released nutrition. Virtually pest- and disease-free if planted in a good location with organically-rich soil to feed from. Deadhead after blooming and clean up fallen leaves in autumn to keep the tree looking its best in every season. Prefers to be transplanted in the fall if moving is necessary, or plant new specimens in fall to allow them to establish before winter. Once your tree peony is established it will reward you each year with an abundance of glorious blooms, bringing exotic flair and distinction to your landscape.